Photograph from an album of 43 views of Burma (Myanmar) from the Sladen Collection, taken by J. Jackson in c.1868. 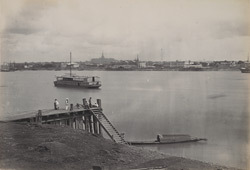 View looking north-east to Rangoon (Yangon) across the Rangoon River from the ferry jetty on the Dalla bank. On the far side are the wharves and jetties of the city's waterfront. Immediately beyond is Strand Road, lined with imposing colonial buildings. After the Second Anglo-Burmese War of 1852, the British took over Rangoon which had been established as an important port from the 18th century. Their military engineers rebuilt the whole city on a long east-west grid plan, and the downtown port area was raised by several feet. Visible on the skyline are the spires of three pagodas: the Sule Pagoda, located in central Rangoon, the Signal Pagoda behind, and the Shwe Dagon Pagoda, Burma’s most revered Buddhist shrine, which dominates the cityscape from its elevated position on Singuttara Hill.